I feel as if I am finally returning to the land of the living after spending last week first clouded in a head full of congestion, then sunk into a carbohydrate coma. So please forgive my late and somewhat abrupt Daring Bakers post for last month. 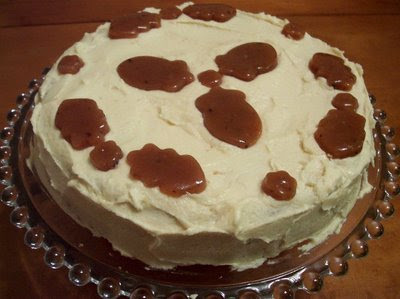 November's recipe was a Caramel Cake from Shuna Fish Lydon. It was chosen by Dolores of Culinary Curiosity, who shared hosting duties with Alex, better known as Brownie of Blondie and Brownie and Jenny of Foray into Food. Caramel is one of my husband's favorite flavors, so I made the cake for his birthday earlier this month with substitutions for my son's allergies. The cake was nice, but as other Daring Bakers have noted, the frosting was extremely sweet. For the caramels on top of the cake I used a lovely dairy free recipe from Maggie of Dog Hill Kitchen. I made a half batch with one of my carefully hoarded clearance vanilla beans to flavor it and used cookie cutters for shapes to decorate the cake. I'm afraid I only got a quick snap of the cake, instead of a real beauty shot, since I realized that I need to take more photos of the family and less of the food at events. So thank you to Dolores, Alex, and Jenny for a sweet challenge and happy birthday, honey! You mean, we're supposed to take pictures of the people, not the food? Ha! You are the best, Libby! I just got your package in the mail today (it was held up in customs for the rice!). I'm so excited, but Guppy was even more excited and has already had her breakfast toasts and her lunch sammie dinosized! And the rice! I love wild rice, but it's imported from the US here so I don't get it very often! Great job on this challenge! Better late than never, right? Ooo, your cake looks awesome! Good idea taking pictures of the people! Your cake looks beautiful... I love the gobs of caramel. Thanks for the nice words about my cake. Your cake looks delicious as well... I love the cute little "holly-like" cut-outs. Very festive!